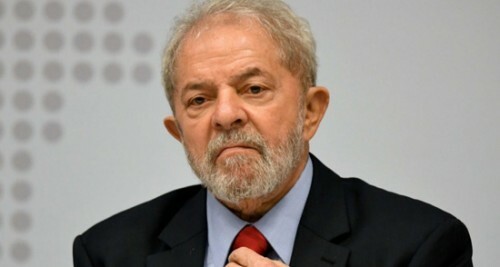 Rio de Janeiro, June 19 (IANS) Former Brazilian president Luiz Inacio Lula da Silva made a debut as sports commentator for a television programme from his prison cell and said the national team should not belittle the Costa Rican squad in the next game. "We are going to prepare for Friday's game without belittling Costa Rica. In the end everyone knows that one day little David beat the giant Goliath," the former head of state said from prison in a written comment read on sports television programme TVT and on Brasil Actual radio on Monday, reports Efe. Lula warned about the need to prepare Brazil's national team well for the second match at the 2018 Russia World Cup after admitting that the "Canarinha" did not perform well enough on debut, in which it tied 1-1 with Switzerland on Sunday. "The guilt apparently was from the psychological moment of the debut or it could have been from the defender Miranda, as seen in the moment of Switzerland's scoring a goal or in the penalty against Gabriel Jesus that was not marked either," Lula said. "But honestly, the truth is that we did not play well and the opponent did what they had to do, which was to block Brazil," Lula added in his comment. According to him, Brazil, for its history and status as a five-time world champion, was the favourite, but Switzerland had two options - either play better or prevent Brazil from playing, "and they chose the latter option." "They scored strong, very hard, and they did not let the Brazilian team play, nor did they let Neymar play and they made many mistakes," he added. Sports commentator Jose Trajano, who invited Lula to send his comments about the Russia World Cup to be read on the television programme, said he does not know when he will receive a new message from the former president, who in April began a sentence of 12 years in prison for corruption.